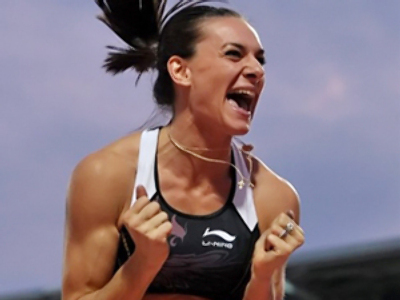 Elena Isinbaeva failed in her latest attempt to break her own world record in the women's pole vault, but still easily won her event at the World Athletics Final in Greece on weekend. She might not have won at the World Championships, but she's won everything else since, including a share of the Golden League jack pot. Last night’s leap of 4.7 meters on her third and final attempt was enough for victory. 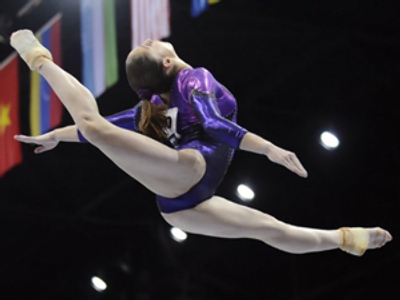 She did go on to try to set a new world record at 5.7 centimeters, but failed. On the track, Usain Bolt made a cameo appearance – he's running in the two hundred on Sunday. So the men’s 100 meters was really a two-man contest between Jamaican Asafa Powell and American Tyson Gay. And Powell must have thought he had it in the bag until Gay – in white – powered through the last few yards for victory, clocking a time of 9.88 seconds. Gay and Isinbaeva each picked up $ 30.000 for their wins.